Imagine a strange poker game where the worst hand wins. Other than Texas Hold’em, the game that’s enjoyed the longest-running tradition at the World Series of Poker is Seven-Card Razz -- sometimes simply called “Razz” for short. It’s a peculiar game. For instance, you don’t want to be dealt royal flushes in Razz. You’ll go broke quickly, if you do. In fact, the object of the game is to make the worst (or lowest) possible ranked hand. That’s right. You want bad cards. Trash. Garbage. Bricks. But the game is hardly for losers. The list of former Razz champions reads like a royal court of poker. Former gold bracelet winners include -- Billy Baxter, Doyle Brunson, Eskimo Clark, T.J. Cloutier, Ted Forrest, Berry Johnston, O’Neil Longson, Lakewood Louie, Tom McEvoy, Huck Seed, Barry Greenstein, Jeffrey Lisandro, Frank Kassela, Phil Hellmuth and other multiple gold bracelet winners who have pretty much written the history of poker. 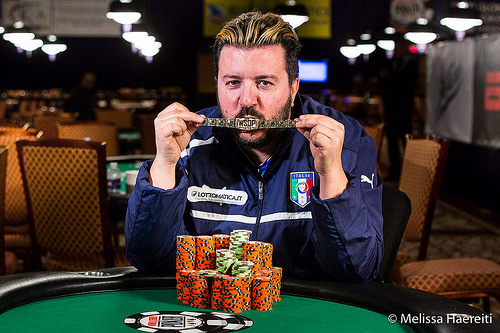 Pescatori, a popular Italian poker pro originally from Milan and now living in Las Vegas, burst upon the poker scene back in 2006, with his first win in the $2,500 buy-in No-Limit Hold’em event. Two years later, he picked up gold bracelet number two in the $2,500 buy-in Pot-Limit Omaha/Hold’em event. During that span, he also won two WSOP Circuit gold rings and also was a significant force on the tournament scene. However, more recent years haven’t been so kind. This victory marked Pescatori’s first win here in seven years. With this finish, the player nicknamed the “Italian Pirate” now has 46 cashes at the WSOP and more than $1.8 million in career earnings. Pescatori’s final table competition was just as tough as one might expect in an event which historically draws more experienced players. Ryan Miller put up a tough fight, but finished as the runner up. 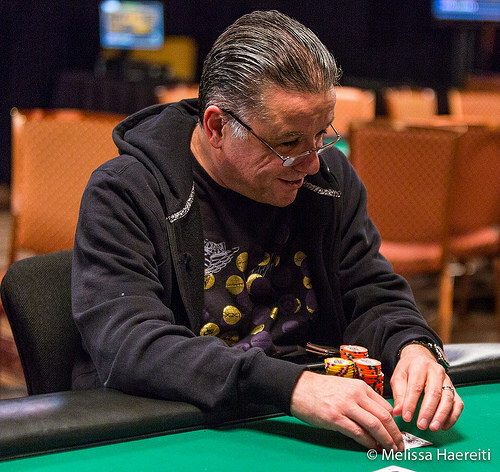 Eli Elezra was also hoping for his third career gold bracelet, but came in fifth instead. Cyndy Violette also bubbled the finale, coming in ninth. Pescatori is now 3-0 heads up in WSOP events, and 5-0 counting his two wins in WSOP Circuits which took place nearly ten years ago. 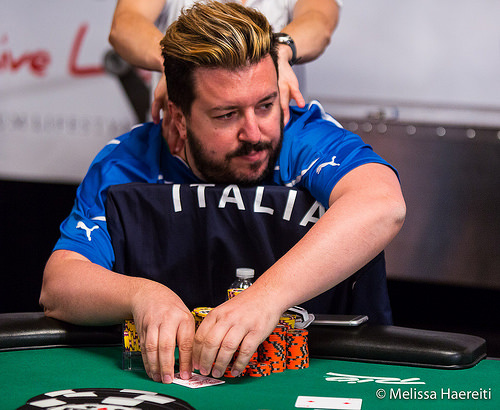 Moreover he became the first Italian player in poker history to win three gold bracelets. The field size at 462 players was a significant increase of last year, when 352 signed up for the same event. Second Place: Ryan Miller, from Longhorne, PA finished as the runner up. He collected $96,349 in prize money. This marked his fifth time to cash at the series, following a previous win in a WSOP Circuit event (2009 in Atlantic City). Third Place: Chris George, from Croton on Hudson, NY took 3rd place. This marked his 16th career cash and fifth final table appearance at the WSOP since 2013. His payout amounted to $61,247. 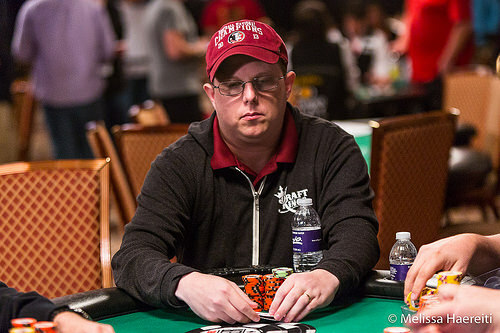 Fourth Place: Matthew Smith enjoyed his highest cash ever at the WSOP in this event, finishing 4th. This was his tenth time to place in the money. The Linthia, FL player earned $44,164. Fifth Place: Eli Elezra, the high-stakes cash game pro and two-time gold bracelet winner originally from Israel and now living in Henderson, NV took 5th place. The $32,245 payout now puts Elezra was over the $1 million mark in career WSOP winnings. Sixth Place: Randy Kaas, from Scottsdale, AZ enjoyed his second time to cash at this year’s series, after also making the money in the “Colossus” event just a few days ago. Kaas’ first final table appearance here paid $24,049. Seventh Place: Robin Lee, from Norwich, CT took 7th place. This was his first in-the-money finish at the WSOP. Lee collected $18,149. Cyndy Violette, a longtime poker pro originally from Atlantic City, NJ and now living in Las Vegas, NV finished 9th. She cashed for the 36th time in her impressive career which now places her three spots behind all-time leader Kathy Liebert among all females, currently with 39. Yueqi (Rich) Zhu, from Rowland Heights, CA cashed in this event in 17th place, good for his 40th career in-the-money finish at the WSOP. Gold bracelet winners from past years -- Randy Ohel, Ylon Schwartz, Bryan Campanello, Luis Velador, Thomas Bihl, and Tom Schneider all cashed -- finishing beyond the 20th spot. Max Pescatori and Ryan Miller both put three bets in on third street. Max Pescatori bets on fourth street and Ryan Miller calls. They do the same on fifth. Max Pescatori bets again on sixth street and Ryan Miller folds, leaving himself with around 165,000. After a bring-in from Ryan Miller, Max Pescatori completes. Ryan Miller raises and Max Pescatori calls. Pescatori check-calls on fourth street but when he bets on fifth steet, Ryan Miller folds. 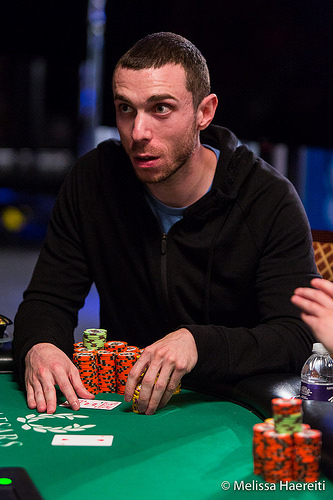 Ryan Miller gets his last chips in after a completion from Max Pescatori, he calls. Ryan Miller makes two pairs on fourth street. Pescatori was already in front after sixth and makes a -low on seventh street and that locks up the win and the golden bracelet. Ryan Miller gets $96,349 for his second place finish, while Max Pescatori is makes $155,947 for his third World Series of Poker victory. Ryan Miller brings it in with a six showing and Max Pescatori completes. Miller raises and Pescatori reraises. Miller calls. On fourth street, Miller leads with a bet and Pescatori calls. On fifth street, Miller bets again and Pescatori calls. Pescatori takes the lead on sixth street when Miller pairs. Pescatori checks. Miller bets and Pescatori check-calls. Both players check seventh street and we go to showdown. Pescatori shows a nine-six low and is best. Ryan Miller brings-in and calls the completion from Max Pescatori. Ryan Miller bets on fourth street and Max Pescatori calls. Miller then checks on fifth street. Max Pescatori bets and Ryan Miller calls. Miller checks again on sixth street but when Pescatori bets, Miller folds. Ryan Miller brings it in and Max Pescatori completes. Miller calls. Pescatori bets again on fourth street and Miller calls. Fifth street is dealt and both players check. Miller bets sixth street and Pescatori calls. Miller bets seventh street and Pescatori thinks it over before calling. "Six low," Miller says, tabling his hand. Pescatori takes one look and mucks. Ryan Miller is the bring-in and Max Pescatori completes. Miller calls. Miller takes the lead on fourth street and bets. Pescatori calls. Miller leads again on fifth street and Pescatori calls. Miller checks to Pescatori on sixth street. Pescatori bets and Miller check-calls. Miller looks at his hole cards and bets seventh street. Pescatori checks his down cards and calls after a few seconds. "Nine-six," Miller says. Pescatori holds up his hole cards for one last look and mucks. After being crippled by Max Pescatori on the previous hand, Chris George (pictured) gets his last 80,000 in the middle on third street against Max Pescatori. When all the cards are out, Pescatori shows a seven-five and George needs an ace or four to win. Instead, his last down card is an eight and George exits the tournament. The competition is now heads up between Max Pescatori and Ryan Miller. Matthew Smith completes after a bring-in with . Max Pescatori raises, Matthew Smith calls. Max Pescatori bets then on fourth street, Matthew Smith calls again. Smith goed all-in on fifth street after another bet from Pescatori. Pescatori got a -low on sixth street, enough to bust Smith out. Matthew Smith eliminated in fourth position for $44,164. Matthew Smith is short stacked and has been the bring in on more than his share of hands. Chris George completes and Smith calls. George bets again on fourth street and Smith calls. Fifth street brings little to get excited about for Smith and he folds to another bet from George. Matthew Smith brings-in with . Max Pescatori completes, Chris George raises and Max Pescatori calls after a fold from Smith. Chris George bets on every street and Max Pescatori calls until the last street. Pescatori shows -low to win the hand. He is the overwhelming chip leader at this moment. Matthew Smith is the bring-in with a ten showing and Max Pescatori completes. Chris George raises and Pescatori calls. Pescatori leads with a bet as George pairs his eight. George calls. Pescatori bets fifth street and George calls. On sixth street, Pescatori picks up a king and checks it to George. George thinks for a moment and bets. Pescatori calls. Both players check seventh street and we go to showdown. George turns over a nine-eight and Pescatori mucks. Max Pescatori completes and calls the raise from Chris George. Chris George bets on fourth street, Max Pescatori calls. Pescatori pairs-up on fifth street but still calls a bet from George. On sixth street George decides to check, Pescatori bets and George calls. Both players check their option on seventh street. Max Pescatori shows -low to win the pot. Chris George completes and gets a call from Matthew Smith. On fourth street bets Matthew Smith, Chris George calls. Same scenario at fifth street. Matthew Smith checks-call on sixth streeth and both players check seventh street. Matthew Smith wins the pot with a -low. Ryan Miller brings it in and Matthew Smith completes. Max Pescatori raises and Smith calls. Smith bets fourth street when Pescatori picks up a king. Pescatori calls. Smith picks up a pair of fours on fifth street and bets. The dealer corrects him for betting out of turn but Pescatori says, "It's okay, I check." Smith puts out his bet and Pescatori check-calls. On sixth street, Pescatori checks and Smith bets again. Pescatori check-calls and seventh street is dealt. Pescatori checks again and Smith bets. Pescatori check-calls and the hands are turned up. Smith shows a , but Pescatori tables a . We have reached the dinner break for Day 3, having completed six one-hour levels of play. Four-handed play will resume at approximately 10:00 p.m. local time. Matthew Smith brings it in and Max Pescatori completes. Chris George calls and Smith folds. Pescatori bets fourth street and George calls. George bets fifth street and Pescatori raises. George calls. George's board improves on sixth street and he bets. Pescatori calls. On seventh street, George checks to Pescatori. Pescatori sighs and checks. "Seven perfect," George says, turning his cards up. Pescatori nods and mucks. After the bring-in, Chris George completes and Matthew Smith calls. On every street thereafter, George bets and Smith calls. Smith stands up as seventh street is dealt to get a better look at George's board. George bets seventh street and Smith resumes his seat to peer at his final card. Smith makes the call. "Seven perfe--, I mean, seven-five," George says as he turns over his hand. Smith sighs and turns up a second-best seven-six. Smith is now the short stack at the table. Eli Elezra completes on third street and Ryan Miller calls. Both players check on fourth street. Eli Elezra checks again on fifth street. Ryan Miller bets, Elezra raises and gets a call from Miller. Eli Elezra checks on sixth street and calls a the bet from Miller, with only 48,000 behind. Miller bets that amount after Elezra's checks on seventh street. Elezra calls all-in, but can not win against Miller's -low. Eli Elezra receives $32,345 for his fifth-place performance.